Go through some of the most important and popular languages in the world of data science, including Python, R, Java, and Scala. I assume that 99.9% of the people reading this article know data is — a collection of facts, statistics, and information of a given subject is known as data, Right? But what about data science? Data science is a “concept to unify statistics, data analysis and their related methods” in order to “understand and analyze actual phenomena” with data. It employs techniques and theories drawn from many fields within the broad areas of mathematics, statistics, information science, and computer science. This field is becoming more and more popular with the advent of Machine Learning all around us. In order to understand data science, we must know at least one of the programming languages. 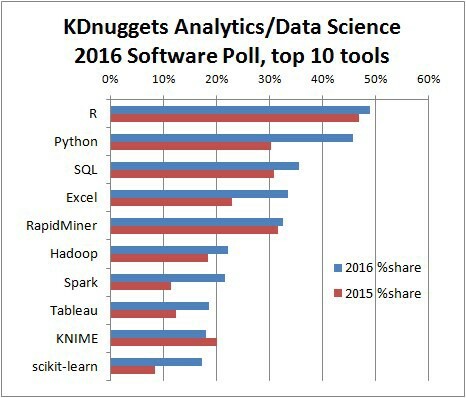 Lucky for you, that are many programming languages that are used for data science. Let’s go through the important ones. Python is at the top of all other languages and is the most popular language used by data scientists. Python is rapidly gaining mainstream appeal and becoming a more practical language to build products. Python is a powerful tool for medium-scale data processing. Python also has the advantage of a rich data community, offering vast amounts of toolkits and features. Bank of America uses Python to build new products and interfaces within the bank’s infrastructure and to crunch financial data.Python is broad and flexible, so people flock to it. Still, it’s not the highest performing language, and only occasionally can it power large-scale, core infrastructures. R has been kicking around since 1997 as a free alternative to pricey statistical software, such as Matlab or SAS. Over the past few years, R has become the golden child of data science — now a household name not only among nerdy statisticians but also Wall Street traders, biologists, and Silicon Valley developers. Companies as diverse as Google, Facebook, Bank of America, and the New York Times all use R, as its commercial utility continues to spread. Java and Java-based frameworks are found deep in the skeletons of the biggest Silicon Valley tech companies. Java doesn’t provide the same quality of visualizations R and Python do, and it isn’t the best for statistical modeling. But if you are moving past prototyping and need to build large systems, Java is often your best bet. The suite of tools for Java is pretty well developed — a range of IDEs and mature features on them allow developers to be reasonably productive. The Java Virtual Machine is very good for writing code that looks identical on multiple platforms — and this suits the Big Data space which, like many other development areas, features platform diversity. Scala is another Java-based language and, similarly to Java, it’s increasingly becoming the tool for anyone doing machine learning at large scales, or building high-level algorithms. It’s expressive and also capable of building robust systems. There are many other languages which are popular and used widely for data science. Some of them are C/C++, Scala, Julia, Closure, Lisp, Perl, etc. Python, 45.8% share (was 30.3%), 51% increase. Java, 16.8% share (was 14.1%), 19% increase. Unix shell/awk/gawk 10.4% share (was 8.0%), 30% increase. C/C++, 7.3% share (was 9.4%), 23% decrease. Scala, 6.2% share (was 3.5%), 79% increase. Perl, 2.3% share (was 2.9%), 19% decrease. Julia, 1.1% share (was 1.1%), 1.6% decrease. F#, 0.4% share (was 0.7%), 41.8% decrease. Clojure, 0.4% share (was 0.5%), 19.4% decrease. Lisp, 0.2% share (was 0.4%), 33.3% decrease.